Summer is synonymous with farmer’s markets, yummy food stalls and indulgent treats, but good things usually come with a price. The summer foods that are most likely to stain your teeth are the ones that are rich in color. 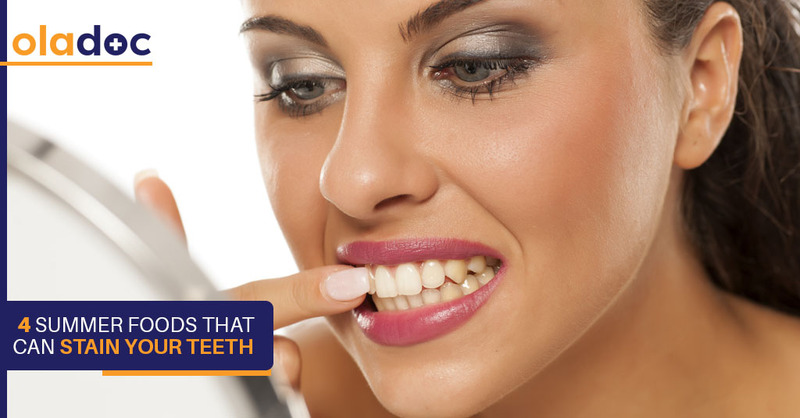 Overtimes these foods can darken your teeth. That’s why is recommended that you rinse your teeth with water or chew a sugar-free gum to protect yourself from the potential after effects. Here are some summer treats that can stain your teeth. Tea is the second most commonly consumed in the world, the first one being water. During the summer season, people often opt for iced tea. Tea offers a string of benefits such as reducing the risk of stroke and heart disease, boosting weight loss, and slowing the memory decline associated with age. However, the plant-based compounds tannins found in tea can stain your teeth. However, that doesn’t mean that you need to quit drinking tea. You can use a straw and enjoy iced tea without fearing that it will darken your pearly whites. Nothing cools you down in the hot summer months like a popsicle. However, the bright colors that make popsicles look beautiful may not necessarily be good for your teeth. Popsicles are full of sugar, which makes you more susceptible to cavities, and also contain artificial colors that can stain your teeth. The staining factor is increased because of the fact that you keep your popsicle in your mouth for a long time. Swap popsicle with healthier frozen treats that are not laden with added sugar and are free of artificial colors. Citrus foods such as grapes, oranges, lemons, and limes are highly acidic and may damage the tooth enamel overtime. This can lead to deep cavities and tooth decay. Therefore, whenever you munch on anything citrusy, rinse your mouth with water afterwards. Water will neutralize the acid in the mouth and protect your teeth from its harmful effects. Berries are not just incredibly tasty, they also offer a lot in terms of nutritional benefits. They are high in flavonoids, the nutrient responsible for their gorgeous color and may protect against inflammation and heart diseases, and free radical fighting antioxidants. However, berries might spell trouble for your teeth as they contain pigmented compounds called chromogens that stick to the teeth enamel, which can result in staining. However, berries are very healthy and you shouldn’t stop eating them just to protect your teeth. To stay on the safe side, rinse your mouth with water after snacking on berries or brush your teeth half an hour after eating them. If you think your teeth look dull and dingy, you can consult your dentist to get them whitened. You can find and book an appointment with top Dentists in Lahore, Karachi, and Islamabad through oladoc.com. You can also call our helpline at 042-3890-0939 for assistance to find the RIGHT Doctor for your health concerns.